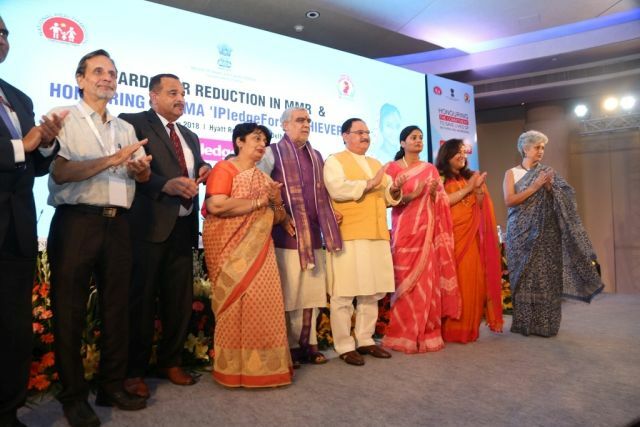 New Delhi: “In just 23 months, we have achieved 1.3 crore antenatal check-ups at 12,900 healthcare facilities across the country and also identified 6.5 lakh high-risk pregnancies.” This was stated by J P Nadda, Union Minister for Health and Family Welfare while giving away the ‘IPledgefor9′ Achievers Awards to the individuals and teams of doctors from the private sector and States for their exemplary services, outstanding support of institutions and commitment from support partners in achieving the mission’s objectives of safe motherhood to every woman in the country, here today. The minister also conferred awards to the States that have shown an exemplary decline in MMR as per the recently released SRS data. Speaking on the occasion, he said that whatever programme the ministry takes up it becomes the largest in the world and it has taken up those programmes which will have far-reaching impacts. He claimed that India has made substantial progress on several indicators in spite of its huge numbers and challenging topography. The minister said that India has shown impressive gains with 22% reduction in Maternal Mortality Ratio (MMR) since 2013. Providing quality services to over 2 crore pregnant women in India required the amalgamation of far-reaching vision, policy, and implementation at the ground level, he suggested. Ashwini Kumar Choubey, Minister of State for Health and Family Welfare said that States joined the programme with equal vigour and Madhya Pradesh, Maharashtra Uttar Pradesh and Bihar and other states have been able to improve their MMR. Vinod Paul, Member, NITI Aayog said that reduction in MMR is remarkable and it’s absolutely phenomenal. Since its launch, over 1.30 crore antenatal checks ups have been conducted by public sector obstetrician-gynecologists and voluntary participation of over 5000 private and in rural, urban and hard to reach government health facilities. This has resulted in identifying more than 650,000 high-risk pregnancies, considered to be a major contributor to preventable maternal deaths. Strengthening the mission’s objectives, around 13000 government healthcare facilities like PHCs, CHCs and District Hospitals are providing PMSMA services on 9th of every month. The mission is proving to be a successful scalable effort by the government to facilitate positive engagement between the public and private healthcare providers to achieve the SDG targets. The mission ensures that every pregnant woman registered under PMSMA receives free, comprehensive and quality antenatal care services in their second and third trimesters across India. Nearly 1000 fewer women are now dying of pregnancy-related complications each month as compared to 2013. The government’s efforts at improving access to maternal health services leading to increase in institutional births have significantly contributed to a groundbreaking reduction in Maternal Mortality Rate (MMR) by 22 percent from 2013 levels. Emphasis on mitigating the social determinants of maternal health like the increase in girl’s education and reduction in child marriages are other enabling factors that contributed to this notable success. Dr. S. Venkatesh, DGHS, Health Secretaries of the States, Mission Directors (NHM), Representatives of development partners including UNICEF, USAID, BMGF and WHO and other senior officers of the Ministry were present in the function.